Something fell a little flat with this one- might have been better structured as non-fiction? Recommended for historical fiction and elephant fans ages 4-6. 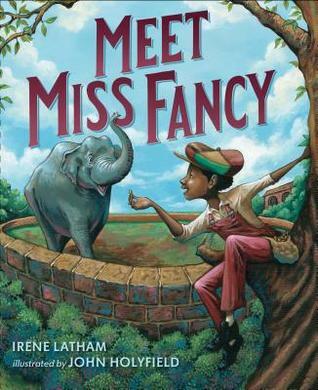 Alabama author, Irene Latham’s latest picture book MEET MISS FANCY, based on the elephant who lived in Birmingham’s Avondale Park from 1913 to 1934. Set during segregation, it follows a boy who tries his best to make a difference and realize his dreams of petting Miss Fancy. This book gently showed the kiddos how unfair people can be. This historical fiction picture book is based on a real character, an elephant named Miss Fancy that lived in the Avondale Park in Birmingham, Alabama from 1913-1934. It speaks of a time when segregation was occasionally trumped by kindness. Latham's lengthy author's note holds historical notes, adding depth to the story. John Holyfield's beautiful illustrations reveal deep emotion. A beautiful picture book. "FRANK LOVED ELEPHANTS. He loved drawing elephants and talking a This historical fiction picture book is based on a real character, an elephant named Miss Fancy that lived in the Avondale Park in Birmingham, Alabama from 1913-1934. It speaks of a time when segregation was occasionally trumped by kindness. Latham's lengthy author's note holds historical notes, adding depth to the story. John Holyfield's beautiful illustrations reveal deep emotion. A beautiful picture book. Although historical fiction, the story is based on a real elephant that lived in Alabama for several years at a park in the segregated South. Elephant lovers will be pleased. Frank battles the laws of segregation to meet a real elephant that he has been forced to love from afar. This excellent depiction of a young boy learning about racism, also demonstrates the power of determination. I enjoyed this story about Miss Fancy and Frank. It is a good choice for opening up discussions about segregation. A fun story based on a true event! This book could serve as a great discussion springboard about equality! What if you were a child, a young boy, and loved elephants more than anything? You loved to draw them and talk about them. You loved their "hosepipe trunks and their flap-flap ears, their tree-stump feet and their swish-swish tails." But, but, you've never ever seen a real elephant. This is a story about that boy, Frank, and his adventure with Miss Fancy, one elephant who spent some years in Avondale Park in Birmingham, Alabama. He is that boy who lived only two blocks from the park and helped c What if you were a child, a young boy, and loved elephants more than anything? You loved to draw them and talk about them. You loved their "hosepipe trunks and their flap-flap ears, their tree-stump feet and their swish-swish tails." But, but, you've never ever seen a real elephant. This is a story about that boy, Frank, and his adventure with Miss Fancy, one elephant who spent some years in Avondale Park in Birmingham, Alabama. He is that boy who lived only two blocks from the park and helped collect pennies with other schoolchildren so the city could raise the money to buy Miss Fancy from a circus. Irene Latham - Irene Latham is a poet and novelist who was born the middle child and first daughter of five kids. Irene has lived all sorts of places and traveled worldwide. Since 1984 she has called Birmingham, Alabama, home. She thinks growing up with three brothers was great preparation for raising her three sons. She also thinks getting a sister was one of the best things that has ever happened to her. Irene is proud to be the only leftie in her family of origin AND in her current family. According to Irene's Dr. Seuss' MY BOOK ABOUT ME, she has wanted to be writer since she was eight years old. She also wanted to train a horse that her sister would ride to victory in the Kentucky Derby. That hasn't happened. Yet. Irene didn't take a single writing course in college.